Tape may seem like an odd art medium to some, but one exhibition is changing minds by turning people into scurrying arthropods. 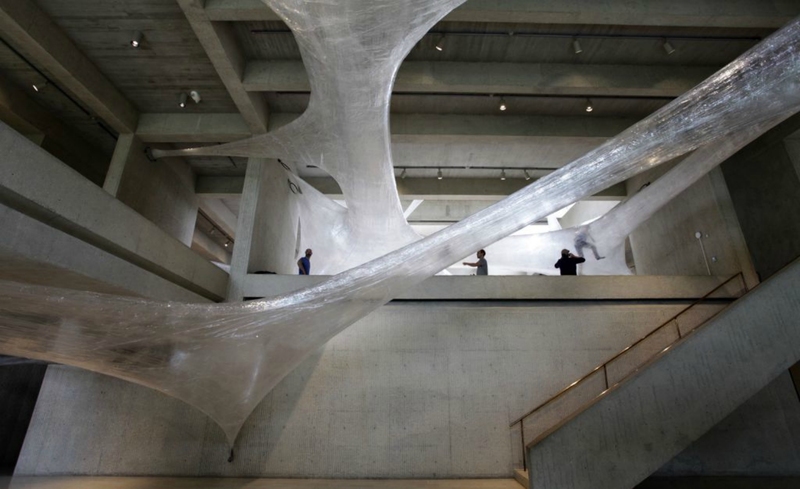 Visitors to the Des Moines Art Center are getting lost inside this giant human-scale spider web made out of thousands of rolls of clear packing tape. The Tape art installation was created by art collective Numen/For Use and invites visitors to explore inside of the unusual suspended labyrinth. Tape is part of the museums’ Drawing in Space exhibit, which features four artists who work with the medium of tape. Art collective, Numan/For Use, is well-known for their creative work with tape, and in this case, used over 1,000 rolls and countless man hours to construct the translucent web. Located in the museum’s upper I.M.Pei gallery, visitors can explore inside the giant maze provided they wear socks and walk in a clockwise direction through the suspended labyrinth. The art collective has created similar tape structures in the past, but this time, the museum’s brutalist backdrop is certainly part of the allure of the installation. 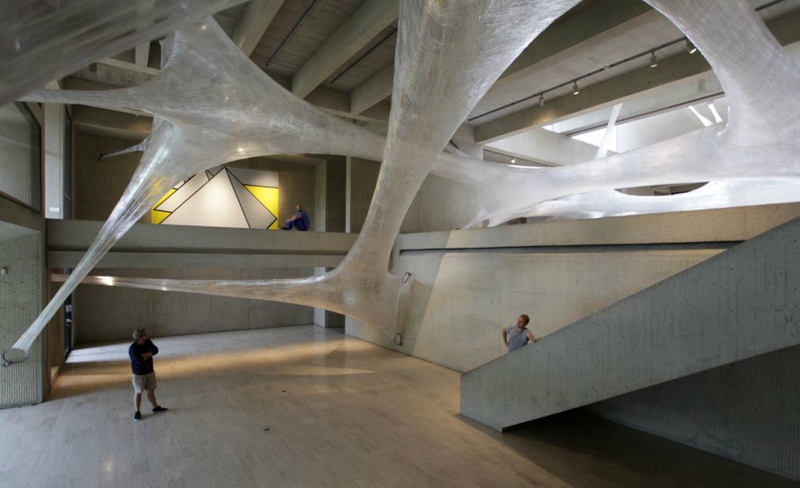 By hanging the massive web in the wide open concrete space, the installation take on a genuine aspect of a real life web created over time by one very industrious arthropod. UPDATE: This exhibition closed on January 21st. The art collective has created similar tape structures in the past, but this time, the museum's brutalist backdrop is certainly part of the allure of the installation. Visitors to the museum can spend their time exploring inside the giant web. 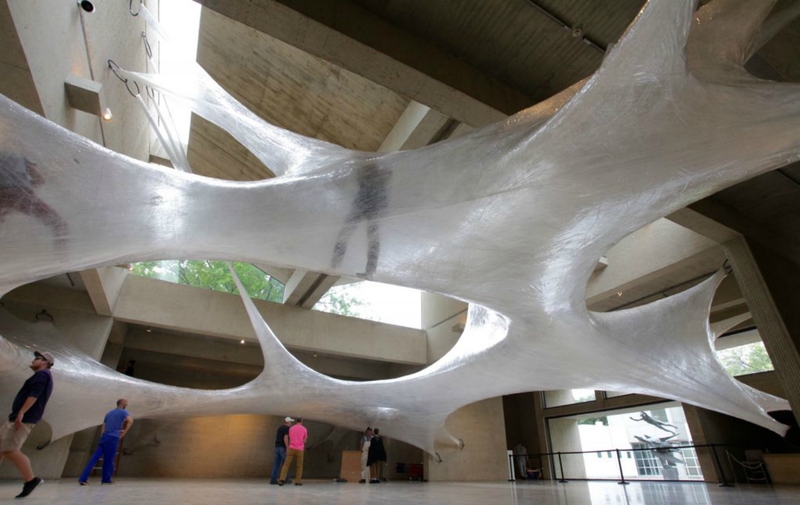 By hanging the massive web in the wide open concrete space, the installation looks like a genuine, real life web created over time by one very industrious arthropod. Tape may be an odd art medium for some, but one massive all-tape exhibition is turning people into scurrying arthropods. 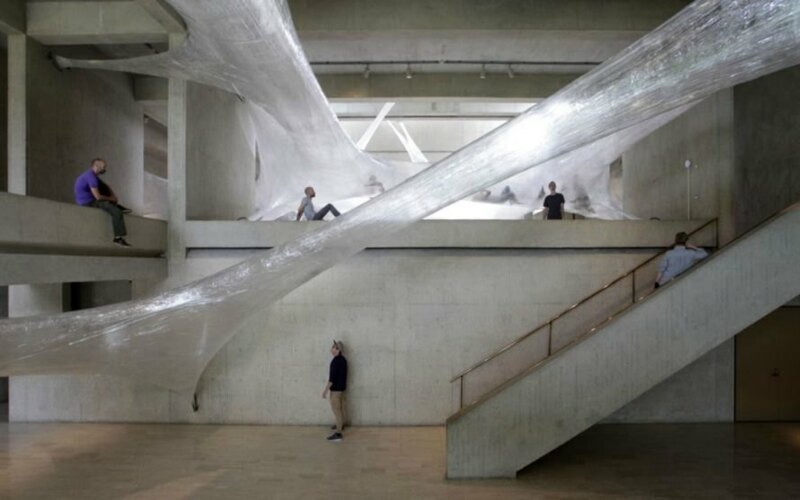 Visitors to the Des Moines Art Center are getting lost inside this giant human-scale spider web made out of thousands of rolls of clear packing tape. The Tape art installation was created by art collective Numen/For Use and invites visitors to explore inside the hanging labyrinth. Tape is part of the museums' Drawing in Space exhibit, which features four artists who work with the medium of tape. Art collective, Numan/For Use, used over 1,000 rolls and countless man hours to construct their latest web. Located in the museum's upper I.M.Pei gallery, visitors can explore inside the giant maze provided they wear socks and walk in a clockwise direction through the suspended labyrinth. Tape by Numen/ForUse is currently on display at the Des Moines art museum.